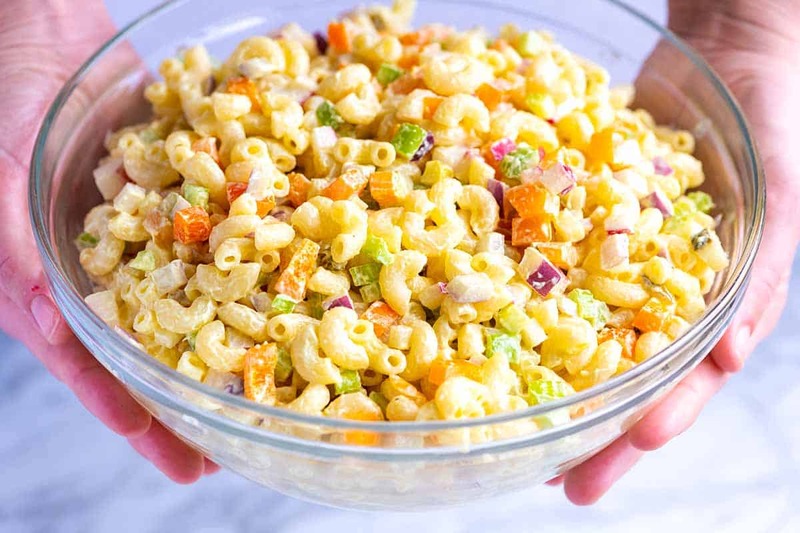 How to make the best macaroni pasta salad with an easy creamy dressing and crisp, colorful vegetables. 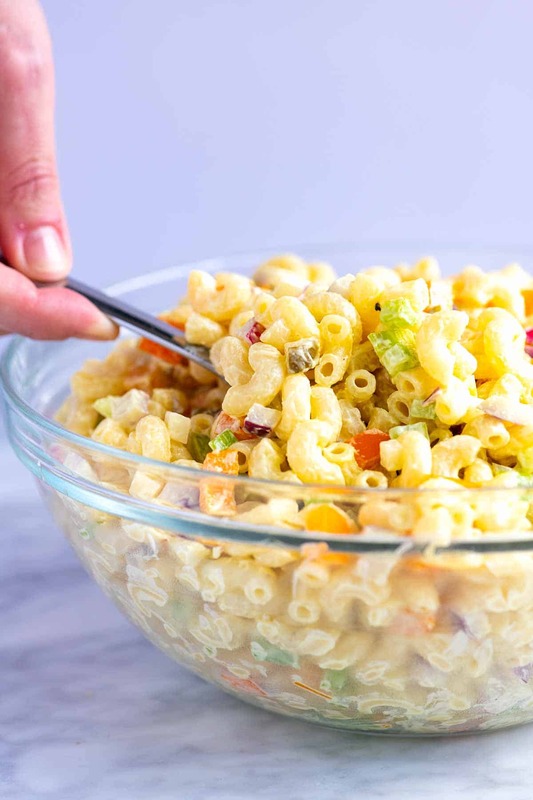 Jump to the Creamy Macaroni Pasta Salad Recipe or read on to see our tips for making it. There are lots of options when it comes to making pasta salad. We’ve already shared a few with you including our Quick and Easy Pasta Salad, this Lemon Orzo Pasta Salad with Cucumbers, and for a gluten-free salad, this Mediterranean Zucchini Noodles Salad. Don’t overcook the pasta. Use the package directions of the pasta you choose as a guide, but a minute or two before it should be done, test it. If done, drain the pasta and move onto our next tip. Rinse the cooked pasta under cold water before tossing with the salad dressing. If you’ve ever made pasta salad that turned sticky, not rinsing the pasta before tossing with the dressing could be the reason. The cooked pasta is coated in starches. By removing the starches, the salad won’t turn sticky or clump as much. Choose lots of colorful veggies and textures to add to the salad. It’s just better this way. Use a bright and flavorful salad dressing. Since the base of our dressing is creamy, we love brightening it up with some acid from vinegar and mustard. If you love sweeter salads, you can add a bit of honey, as well. For creamy macaroni salad, we love using a slightly adapted version of our potato salad dressing (it gets rave reviews). Instead of just using mayonnaise, which can make the pasta heavy, we combine mayonnaise with sour cream. Since the sour cream has a bit of tanginess, it lifts the flavors of the dressing, just as fresh lemon juice would to other dishes. Yellow mustard adds a bit of color and rounds out the flavor of the dressing nicely. 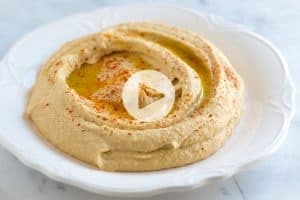 We usually use Dijon mustard in our recipes, but just like when making our potato salad, we prefer regular yellow mustard for the best pasta salad. Apple cider vinegar adds even more flavor to the dressing. 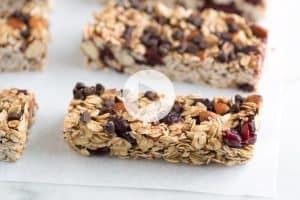 Just a tablespoon will do it. 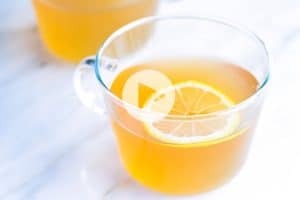 If you don’t have apple cider vinegar, most kinds of vinegar will do, especially white or red wine vinegar. Salt and pepper are a must when it comes to making the dressing. There’s a lot of pasta and vegetables going into the bowl. Nobody wants an unseasoned salad, right? We start with a 1/2 teaspoon of fine sea salt and go from there based on taste. 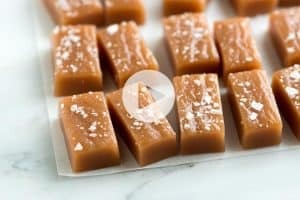 Honey is an optional ingredient. We typically stay away from sweeter pasta salads, but if that’s what you love, add a tablespoon or so of honey to the dressing, and you’ll be a happy camper! What Goes into a Creamy Pasta Salad? When choosing the pasta shape, choose something that will hold onto the dressing. Shapes that have nooks and crannies like elbow macaroni, small shells or even spiral shapes work nicely. Add some color and texture with a variety of vegetables. 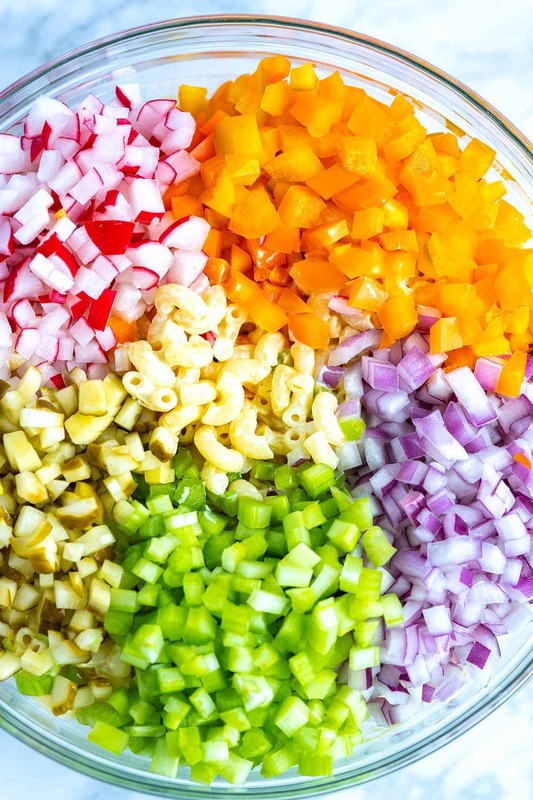 We always end up adding onion and prefer red onion for the pop of color. In addition to the onion, we love celery, bell pepper, and radish. For more veggie suggestions, check below where we share possible variations to the salad. For a little extra brininess, we love adding chopped dill pickle. You could leave this out or swap with a sweeter option like bread and butter pickles or for something different, go for spicy! Turn this into an Italian pasta salad by adding a handful of chopped ham or salami and some cubed cheese. A dash of dried oregano would be excellent, as well. For more of a vegetable-packed salad, consider stirring in peas, tomatoes, corn, cauliflower or broccoli. The key to the best creamy pasta salad is to rinse the cooked pasta under cold water before tossing with the dressing. Skipping this step means the dressing will turn sticky. We also “de-flame” the onion, which tames raw onion flavor so that the onion does not take over the salad. A quick bath in cold water does the trick. Cook pasta according to the package directions, drain and then rinse well under cold water. Meanwhile, add the chopped onions to a small bowl and cover with cold water. Set aside for 5 minutes and then drain. This “de-flames” the onion ensuring that it won’t taste too strong in the salad. In the bottom of a large salad bowl, make the dressing. Whisk the sour cream, mayonnaise, mustard, cider vinegar, salt, and pepper. 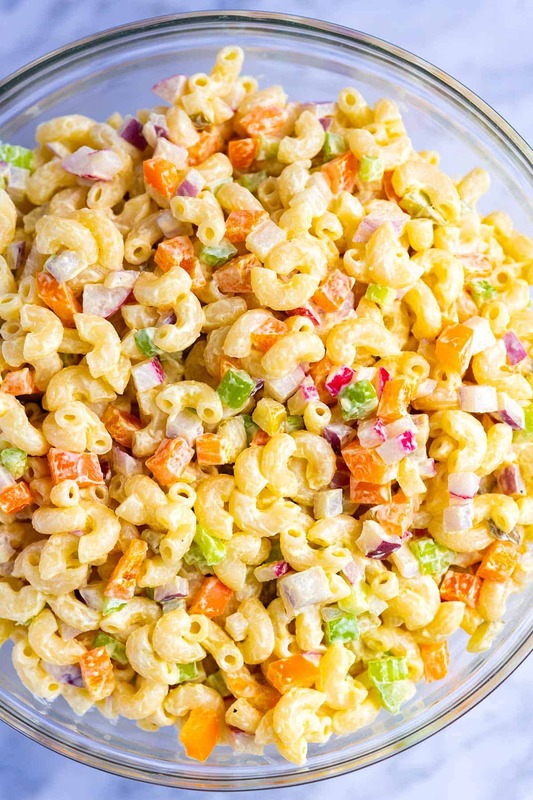 For a sweeter macaroni salad, add honey to taste. To the bowl with dressing, add the rinsed macaroni, drained onions, bell pepper, celery, radish, and the pickle. Mix well. Taste then adjust with additional salt and pepper. Keep the pasta salad, tightly covered, in the refrigerator for up to 3 days.